The LEMP software stack is a group of software that can be used to serve dynamic web pages and web applications. This is an acronym that describes a Linux operating system, with an Nginx (pronounced like “Engine-X”) web server. The backend data is stored in the MySQL database and the dynamic processing is handled by PHP. 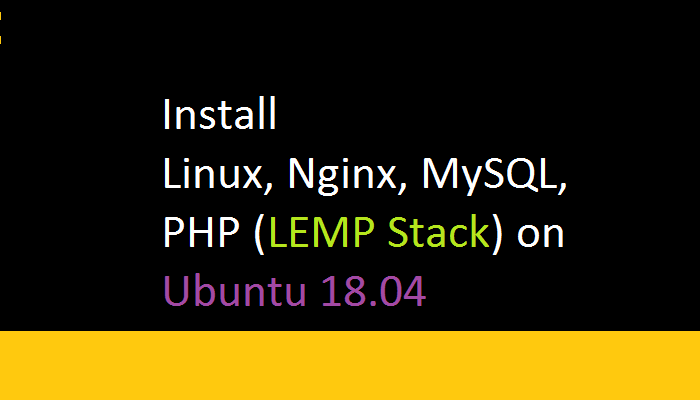 In this tutorial you'll learn how to install a LEMP stack on an Ubuntu 18.04 server. To begin with this tutorial, you should have a regular, non-root user account on your server with sudo privileges. You can follow our basic server setup guide for Ubuntu 18.04. Once you have your user available, you are ready to begin with the following steps. In order to publish web pages to our site visitors, we are going to install Nginx, a modern, efficient web server. All of the software used in this procedure will come from Ubuntu's default package repositories. This means we can use the apt package management suite to complete the necessary installations. On Ubuntu 18.04, Nginx is configured to start running upon installation. If you have the ufw firewall running, as outlined in the basic setup guide, you will need to allow connections to Nginx. Nginx registers itself with ufw upon installation, so the procedure is rather straightforward. It is recommended that you enable the most restrictive profile that will still allow the traffic you want. Since you haven't configured SSL for your server in this guide, you will only need to allow traffic on port 80. With the new firewall rule added, you can test if the server is up and running by accessing your server's domain name or public IP address in your web browser. Now that you have a web server, you need to install MySQL (a database management system) to store and manage the data for your site. The MySQL database software is now installed, but its configuration is not yet complete. This script will ask you to supply a password for use within the MySQL system. After this, it will ask if you want to configure the VALIDATE PASSWORD PLUGIN. If you've enabled validation, the script will also ask you to select a level of password validation. Keep in mind that if you enter 2 – for the strongest level – you will receive errors when attempting to set any password which does not contain numbers, upper and lowercase letters, and special characters, or which is based on common dictionary words. At this point, your database system is now set up and you can move on to installing PHP. You now have Nginx installed to serve your pages and MySQL installed to store and manage your data. However, you still don't have anything that can generate dynamic content. This is where PHP comes into play. Since Nginx does not contain native PHP processing like some other web servers, you will need to install php-fpm, which stands for "fastCGI process manager". We will tell Nginx to pass PHP requests to this software for processing. You now have your PHP components installed, but you need to make a slight configuration change to make your setup more secure. In this file, find the parameter that sets cgi.fix_pathinfo. This will be commented out with a semicolon (;) and set to "1" by default. This is an extremely insecure setting because it tells PHP to attempt to execute the closest file it can find if the requested PHP file cannot be found. This could allow users to craft PHP requests in a way that would allow them to execute scripts that they shouldn't be allowed to execute. This will implement the change that you have made. Presently, you have all of the required components installed. The only configuration change you still need to make is to tell Nginx to use the PHP processor for dynamic content. This concludes the installation and configuration of your LEMP stack. However, it’s prudent to confirm that all of the components can communicate with one another. Your LEMP stack should now be completely set up. You can test it to validate that Nginx can correctly hand .php files off to the PHP processor. If you see a page that looks like this, you've set up PHP processing with Nginx successfully. After verifying that Nginx renders the page correctly, it's best to remove the file you created as it can actually give unauthorized users some hints about your configuration that may help them try to break in. You can always regenerate this file if you need it later. With that, you now have a fully-configured and functioning LEMP stack on your Ubuntu 18.04 server. A LEMP stack is a powerful platform that will allow you to set up and serve nearly any website or application from your server.